Get out of here plain, boring white-colored vanilla ice cream, there’s a new, more vibrant vanilla in town. Or, at least, that’s the hope one physicist and entrepreneur has with his newest invention: invention: Color-changing ice cream. Manuel Linares invented Xameleon, an ice cream that changes color as you eat it, Christian Science Monitor reports. Here’s how it works: The ice cream, which Linares says is made with all natural ingredients, is first sprayed with a “love elixir” that sets things in motion. The spray apparently acts to accelerate the color-changing action. 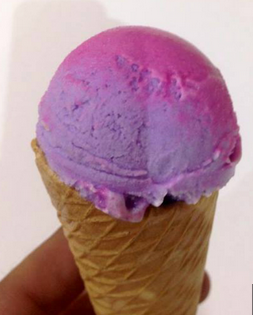 Next, the heat of your tongue and acidity of your saliva reacts with the recently sprayed ice cream to magically change the color from periwinkle blue to pink to purple. While you can’t just spray any old ice cream to create the color-changing dessert, consumers who have tried Xameleon say it tastes tutti-frutti. Linares tells CSMonitor that he was inspired by the glow-in-the-dark ice cream made by a British food inventor last year. Although the ice cream sounds interesting, we won’t be getting a scoop anytime soon. That’s because it’s only available at Linares’ store in a tiny Spanish town. But there’s still hope — Linares hopes to expand the dessert in the future.